Looking to Hire a website designer in 2018. Read these 5 reasons to Hire Eadetech web design for all your web needs, and call us on 0845 303 9394 today. Happy new year to all in 2018. In this new year, are you considering to design a or redesign a website for your business?. Hiring a web designer can be a challenge in itself, however we want to highlight to you 5 reasons for why in this new year, why Eadetech Web Design should be the web company of your choice. We don’t want to just work for you, but to work with you too in understanding your business services, audience and products which will help us to create a bespoke designed website in a way to reflect your business and give it the edge your website needs. At many stages of a website project, there’s always other questions that arise and one benefit from our web design services is we offer free advice and suggestions to help improve the overall website. You may have many suggestions for your website in layout, colours etc, but for the best outcome, by combining your business knowledge with our experience, we can produce a website that is usable, friendly, professional and that uses colours in a complimentary way. Being a small company, were able to be flexible with prices compared to a larger agency. We provide affordable website solutions (without compromising on quality) that can benefit your business, especially at present as we have regular special offers to help you in this new year. 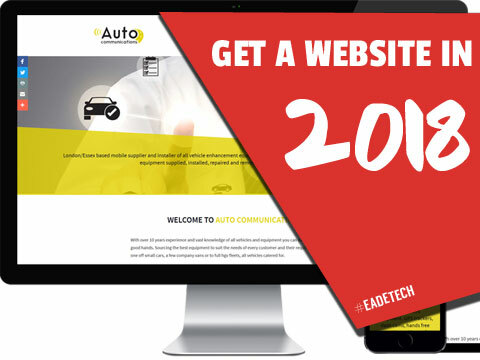 Choosing Eadetech for your web services means all your web services are catered for, whether for new website designs or redesigns, graphic design,web maintenance, domain, hosting, paid and organic web services for promoting your websites. We can also design and print business stationery as part of or separately to any web project. We have many customer reviews with all positive feedback. This should give you more reason than any for feeling confident of the work previously we’ve provided to other customers. Visit our testimonials page or visit our google maps page for Eadetech to see all our reviews. Let us work with your business in 2018 and give us a call on 0845 303 9394 or email hello@e-techuk.com to hear how we can best help your business.